Chart No. 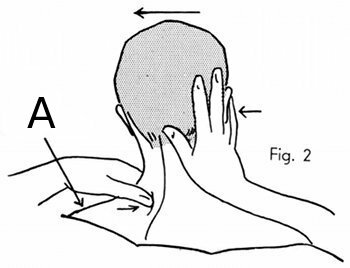 47 - A Well Supported Move in Sitting Position for Muscle Release of the Neck and Dorsal [Thoracic] Region Down to the Ninth Vertebra. 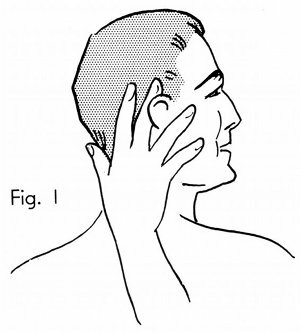 Contact of the fingers behind the ear on the jaw, and the hand on the neck so that the head can be rotated. Note the support on the neck and shoulders so there is no strain. The middle finger is behind the ear. The bracing contact point on the high shoulder side. 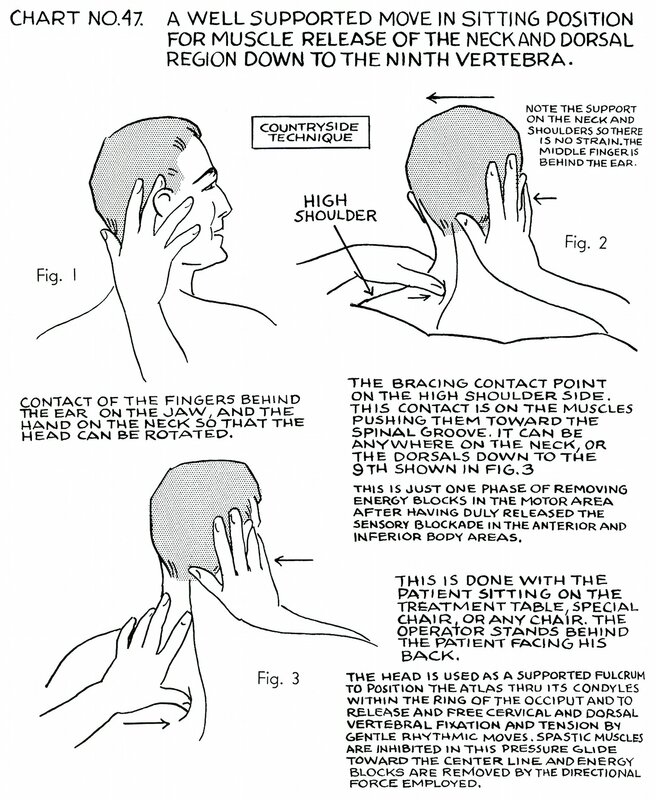 This contact is on the muscles pushing them toward the spinal groove. 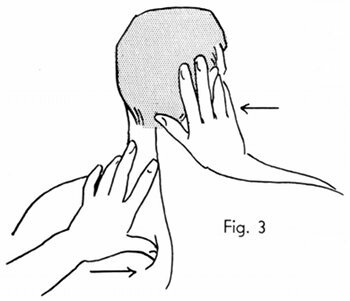 It can be anywhere on the neck, or the dorsals [thoracics] down to the 9th [ninth] shown in Fig. 3. This is just one phase of removing energy blocks in the motor area after having duly released the sensory blockade in the anterior and inferior body areas. This is done with patient sitting on the treatment table, special chair, or any chair. The operator stands behind the patient facing his back. 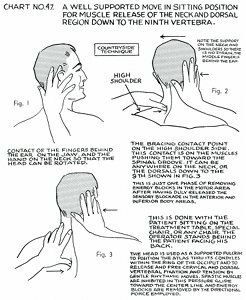 The head is used as a supported fulcrum to position the atlas thru [through] its condyles within the ring of the occiput and to release and free cervical and dorsal [thoracic] vertebral fixation and tension by gentle rhythmic moves. Spastic muscles are inhibited in this pressure glide toward the center line and energy blocks are removed by the directional force employed.